ALUM BENEFIT The Benefits of Alumnae/i Engagement NCAA interviews outgoing Alum Coordinator Claire Michelsen (2008-2009), who re flects on the Alumnae/i Association, the Alum Coordinator position, and the benefits of continued alum engagement CAA: Why u ere you fir t interested in the po ition? M: I first heard about the Alum Coordinator poition from my friend, alumna Holly Lilli. 3, who wa, the fir t person to hold the position ju t l\'er two year ago. ln corwer arion with her during my la. t year a a ew allege snrdent, I learned that alumnae/ i continue to engage with ew olleg in many ways not ju 'tat P P and Reunion Weekend_ Holly and l would often eli, uss the experien e of being a recent graduate, and eventually dis ussed CAA's po t-graduation engagement. In my fifth year at F, I wa beginning to get nervou about my post-gradu ation transition. Thinking about the po ition, l took a closer look at CAA and talked with Holly about her feelings about the importance of the Alumnae/ i As ociation. I never thought the fir t way I would reconnect with ew Col lege a a graduat would be a an employee! In the end, I think I applied because ew College waand remain important to me and CAA i a place where I could hdp keep ew College culture alive, as well a learning new kilL and profe ionali m to aid my tran ition from academic to profes sional life. (Aith )Ugh, looking back, I think I didn't actually know what l wa in for.) NCAA: Wlw.t tms the most significant or Claire Michelsen '03 t aluable experience you't e lw.d as Alum Coordinator! M: I have to ay that over the cour e of the year, I wa sur pri ed by the significance of CAA' pre ence in o many impor tant programs. Ultimately, I have been impacted the mo t by the breadth and scope of CAA's program many of which imul tancou ly benefit tudents, alum and the college it elf. Perhaps the mo t tangible and moving experien e I hac.l were CAA's "Coffee Talks," which arc part of the Mentoring Program. l had the pleasure of meeting many amazing alums who came back to campus to talk with small groups of mdcnts about their paths after New College. Every alum wa uniquely in piring and I loved hearing their torie and candid advice. I felt o proud of cw College, but also o grateful to the alum for baring and offering opportunitie to student But I was more moved by the tudents' enthusia tic appreciation. After these talks, tudents ll IMBl l R expressed the importance to them of hearing about the path of a ucce ful alum in the careers they plan on pur uing. CAA : Why should alums stay involved with ew College and the Alumnae / i Associatwn? CM: Continuing to engage with the college, CAA, faculty, and current tudents i what make ew College more than a past experience u eful for no talgic remembrance. Beyond keep ing ew College alive, engaging with CF show alum what their n w relation hip with the college can be. I think many young alums feel that they are cut off after four or five years of inten e connection with the community they felt so supported by. And while the relation hip between al um and the college is nece sarily different than that of current students, CAA offers both an avenue for young alum to eek upport for their careers and a way to keep a en e of community with ew Colleg Additionally, the chool i hanging and growing and many alum have experienced how continued contact, donating time, and donating money allows them to give input and enjoy participating in the suc ce of an important institution as it grows. CAA: How has working as Alum Coordinator slw.ped your future? CM: I will never take AA or ew College for granted! I will alway appreciate the ervice and program that theN AA board and office provide, which are ever-improving. I've been deeply shaped by working for a non-profit who e pur poe i to upport the in titution that just allowed me to have uch wonderful educational opportunitie and continued to as sist me after graduation by guiding me through the Fulbright application proces Working in the Foundation and at M, l learned about the many ways alum have used their experi ence at ew College to make new path and careers that are both socially and per onally meaningful. But I've al o learned that it i continuing alum engagement, am ng other things, that en ure that ew College remain::; the uniquely tran formatiYe in. titution that it wa for o many. I want to tay involved with my alma mater-to continue the benefit of that engagement, and, importantly, to give back! TRATEGIE Economic Health Alums find alternative strategies for fighting the economic blues By Chelsey Lora 'OS & Austin McCann '04 ew College alum, arc practicing an imporranr method of weathering our stormy national economy: s1mple liv1ng. Whether formal adherents to the simple living movement or individual p r actitio ners of sustainable living, a lums around the country have e chewed America' dominattng bigger-i -better culture tor a do,e of good old-fa hioned self-reliance in the form of home sharing, ustainable energy, and food production. future by being able to provide for basic neeJ:; becau e "old strategic of p lanning, in vestment, and retirement are not reliable Earle Barnhart's '68 halfhouse halfgreenhouse, designed to provide basic needs through so l a r energy and food production I. GREE UVI G Earle Barnhart '6 wrote his ew College thesi on the fea ibility of an ecologica l ly-su tainable community in a po t-petroleum age. ow, Barnhar t is uti lizing his the i by exploring hi re earch in hi per onal and profe ional life. He i, an ecological landscaper and alterna tive agriculture system manager in Mas sachw.ctts. Barnhart and his wife, Hilde Maingay, live in an energy-efficient house connected to a olar greenhou e in which they grow vegetable and tree crops. Their home is part of a co-hou ing communi ty where residents of mdi\'ldual homes col lectively plan, own, and manage the com munity. In the 1970s and 0 Barnhart and Maingay worked at the 1ew Alchemy In titute, a re earch center that exp lored organic agriculture, aquaculture, hio shclter, hou. ing, and landscape de ign. When they undertook the bui lding of their "hal f-hou e, hal f-grecnhou 'C," they sought to include what they'd learned working at lAI, including "all of rhe 'best practices' of olar design and home-scale food production." Barnhart' re earch into organic l iving ha many economic, as well ecological, benefits. He noted, "Our home is designed so that Olar en ergy provides most of our heat and elec tricity, and ome of our food." Barnhart empha izes investing in the 4 IMbl t \H R g due to variou economic di ruption and global trend '' When a household pro duce irs own food and energy, it become le s su ceptibl e to the financial I urdem of the economy. Barnhart explain "The concept i to so lve ecological and energy problems with action at the lowe t func tional level of ociety: the hou ehold and mall community. People gravitate to this approach when they lo e confidence that governmental p lanning and service will be available and prov1 lefor them." 11. FR GAL LIV I G imilarl)', another method of financial independence is simple l iving, a m ove ment ba ed in frugality, environmentalism, soc ial ju tice, and piritual ity, which is finding many proponents in thee try ing times, including cw ollege alum Although simple living was originally practiced by counterculrural and religious communitic it ha become increa ingly popular in the bus1nes world, where it is used a a tool of productivity and finan cial stability. Helen Gabel '68 and Phi l otermann '68 are married and reside in cattle. In the 1980 they attended a financial work shop led by Vicki Robin-co-author of the bestselling Your Money or Your Life! that completely changed their relation hip with money. I n accordance with an unporrant tenet of her book-to reorder material priori tie and live well for l e -the couple qu1t their 40-hour-a-week jobs and began shifting their time toward the improvement of their commumry and live "Thi per pective on the way we ,pend money he lped u to understand that rhe way we pend our money is a di rect mea ure of how we arc spending our lives," otermann said. ow, we have enough money that we an put more life energy into projects that are closest to our heart. Gabel and otterman say that their experiences at ew ollege helped them learn to think independently, l eadmg them to this way of life. Gabel work part-time as a midwife and teacher; both he and otermann volunteer for l ocal non-profit They bring their philo ophy home, well, to a hared house of five adults, where cooki ng is collective, and a greenhouse garden provide food. Gabel and otterman hoth pointed ut that they are not a financially affected by the tate of our economy as they wer e in their previous occupations. They rold Nimbu that rhis lifestyle makes them more stre -free, sat isfied, and stable. What the e alum have in common i a collective de ire to change the way we live, one per on, one commumty at a time, the effect of which makes them l e s susceptible to the whims of a fick l e econ omy-and they are nor alone. Their green and frugal living pracnces are ref l ected in communal expe riments a ross the coun try and through the popularity of blogs uch a Zen Habrts, which propo 'Cs that simple living means: (1) identifying what i most important in your life and (2) climmating everything el c.
CLASS OTES which just celebrated it:. fir t and i going trong. He urges New ollcge alUI.11S living in 1y an Francisco, Bo ton, Pan Munich, Berlin, or lA to attend the under oround Bootie partie thrown in those citie .... l 'jl ee BoorieU A. om for L era1 1991 1994 Matthew W. Grieco will serve as a law clerk for Judge Peter W. Hall of the United tares Courr of Appeals for the econd Circuit for a one-year term beg inning in January 2010. On May elebrateJ the first birthday of their baby girl, tella. tacey works a an architect for the award-winning offi e of GooJy l aney in Bo ton. Kelly Clark anJ Adam Rains '94 were marrie I July 5, 200 in Dalla Texa>. Rev. Herb Rains of 24, 2009, Matthew married Kimberly Grant of BloomfielJ H ill:;, Michigan, whom he met during law Matthew Grieco '94 with br i de Kimber l y Grant (r i ght), Best Man Charles Choi '95, and Matron of Honor Tara Sen (left) Goody Clancy i an interJi ciplin ary de ign f i rm focused on archi tecture, p l anning, and pre ervarion. the Univer al Life Church officiated The wedding parry included C alum Danny Berke '94, Jill (Doran) Braxtan '93, Tenea Johnson '94, and Heidi Paskoki '93. Other C folk in attendance were Kelcey (Burn ) Edward '94, Kelly ichols '95, Jen (Latham) Robinson '95, and Dalla chool. Matthew and Kimberly live in Hoboken, ew Jersey. 1995 Kara Andrade i the online c< mmunity organizer for pot. Us, a nonprofit pioneering communiry-funded reporting, which create a marketplace for journali rs, media and the community to create new Kara Taylor '91. In other new Kelly recently accepted a positi n in the Simon Gradu ate chool f BusiKelly Clark '91 and Adam Rains '94 i also the recipient of a Fulbright grant to create a citizen media website focu ed only on i ues ne s Office of Advancement at the Umver Jty of Rochester. he will be focu ing on alumni relations and development activitie Sheila Bishop "gird her loin for her la t year in an MFA in Digital Media Art at the Univcr iry ot Florida. Her "art freakery i beginning to pay off, at lea tin term of recog nition, if not quite in cold hard ca h." ome of her video work in the charaLter of Bishop Bi hop "will subject people-she mean be by people-in Europe in the fall." he was al o named an Associate Arti t f. r a three week re idency at Atlantic Center for the Arts. 1993 an I torie that are user-gen erated and important to Guatemalan citi zens both locally and in the Uni ted tares. he will be travel l ing to her native Guate mala ro tmplement this project in 2009. For more information go Kara Andrade '95 to: http: / I ojonow.com / guatemala/. 1996 Ari Weinstein and Kari Ellingstad '94 welcomed Ezra Alexander into the world on Thurday, April 30, 2009. He weighed 4oz, and is already mak ing his big sister Else jealous. Kari write Ezra Alexander Weinste i n son o f Ari Weinste i n '93 and Kari Ellingstad '94 Jeremy McMinis i s puruing a Ph.D. in physics ar the ni\'ersiry of Ill i n ois at Urbanahampaign. He will be pend ing about ha l f of hi time at Oak R i dge National L'lb outside of Knoxville dur ing the next calendar yea r He wr i te "I would like to get in touch with anybody from C that i in eithe r a r ea that I knew or didn't. AI o, anyone interested in computanonal chemi try and super computing is welcome to me age me at pixcl34@gmail.com." "1 am on Facebook now, so look us up!" IMBl l 1MER l. 9 Stacey Lucas married Bob Cronin '95 three years ago in ew Orleans and ju t Goody Clancy wa recently awarded the contract for the new Homeland Security contract in Wa hington a well a the p lan to rebuild ew Orlean and tacey ha be omc i nvolved in both projects. Right now, she i s finishing con truc tion admini tration for a LEED EB (Leade r -hip In Energy Efficient Des i gn for Exi t ing Buiklmg ) John McCormack Federal Building downt wn. Prior to join i ng Goody Ian y, he completed the Hall of Patriot at Gillette radium with Arrow trect. Erica Jacobik recently earned the title of RLSO Junior Offi cer of the Quarter and was nominated for Junior Officer of the Year by the United tate avy. Jacobik was selected a the JOQ out of eight officers throughout the region (which include Atsugi, Diego Garc ia, Guam, Mi awa, Oki nawa, ascbo, and Yokouka) during January-March 2009, namely for the super ior knowledge of mil i tary ju tice she eli p l ayed during severa l high-profile case he headed at AF Atsug i The cases ranged from Regi on Legal Service Office Japan Judge Advocate General Lt. Erica Jacobik '96 p r ovid i ng counse l concerning an attack on an Arsugi-based sailor to overoeeing alcohol-relat ed and drug case cou rt s martia l masts and appeal re pon es, m i litary andre sponding to an I nspector General complamt. jacobi k routinel y provides lega l trammg to officers around the region, coordinar and o r ganizes U. Emba sy immigrat ion vi it' for ailo r and family members, and builds and mainta i ns r e l ationships with local host nation Japane e prosecutors and po l ice officers. RADUATIO Above All ... much change painful change; New College grads reflect ab o l utely W\.Hthwhile change he would go through. For me to a k that I woukl hme made this very on their time at New College with fondness difficult change earlit:!r doe ATE BOL L HWEILER '05: I just filled out the the ques tionnaire asking about your experiences at C\\ College. One question in particular got w me: "If you were to go through your four years here, what would you do differently7 It got to me l ecau e I've made so many mL m ke ince I've come here: missing as ignment drnpring destroying hurting people. I wrote, "I would l ecome courageou earlier." I know that this wouldn't change rho e mistake ; I know [would have made not ju. t those, but many more. Burl would have made them earlier, so I wouldn't have hurt myself a much o [wouldn't have hurt other as mu h. I would have grown earlier. I would have developed more. And further. But from where I 'm stan ling now, I can ee that thts wi h i. unfair to my exper i ence here. TI1e person I wa four years ago never aw hun elf in me, never imagined how not honor all the other changes that had ro take place first. l won't be bitter that I didn't change earlier, that [didn't become <. :tlU rageous earlier. Bur I will keep the ideal courage in mind. In heart. I willm t sh1cld my elf-stunt mysel f-with fear. o. o lon.ger. I wdl be cou rageou (This fall, Nare will partlCI(Iate 111 Part Ill of the Mathemauwl Tripos at the Uniwrslt) of Cmbridge to receite the Cmbridge acifi. :utc of Adtanced wdies in Mathematics.) JE S ICAA E WHEELER '05: To the ew College community: thank you t(H four years of incredible experience new under tanding and loving life. I could not have a ked for a more amazing, fanta tic, whims1cal pia e to have grmvn and changed a a person. Through whatever acrimony or di cord, we are a communityand that's impo sihle to es cape, so accept it, and move forward from there! Thank you for en dies illy danc ing, sun ets at the bay, ba r efoot occer, unexpected erenade naked potluck the ense of ccunty, the welcoming and open narure (in wme ways) of th i env ironment, amaz i ng aca demic Ji cu sions in strikingly non-academic conte. t and above all, love Uessica is beginning the Anthropology Ph.D. program at Tulane L'niwrs1ty in eu Orleans this fall) To rea d more, please visit www. a lum ncf.ed u / n i mbus-news Tlw Four \\'inds Legacy Society honors alums and 1ary Rui1. '7S hnow. alxntt building a legacy. A-. P csidc 1t/ CEO of :\1anatee C7lens, Mary ha. built an organization \\ ith a tate\\ ide reputation f(H innO\athe community sen ice. Manatee Glens a not-fiw-profit hospital in Bradenton, prm iding mental health sen ices tor !ami lie. in crisis f(>r me1 :JO years. \Yith the 2Jth .\nni,ersary of 'CAA and the :JOth Annl\ersary of 'c" College fa t approachmg, :V1ary is committed to building another legacy. \ a ( ollege Tnt. 'C\A Pa. t Pre. to lent, and member of the Four \Vinds lkgacy Socie1 y, 'vlary lwlps to ensure that. c,, College \\Ill celebrate academit e:xrdlcnce for centuries to rotected and nurtured by one of us in love with the idea of New College." l nYest in future generation. of gifttd scholars! Imest in the future of ocicty it. elf! Imcst in 1 'e\\ College! On behalf of fi.tturc 't'\\ C"ollq? ;e .,tudents thank you! BACK PAGE N1MBUS New College Alumnae/i Association New College Foundation, Inc. 5800 Bay Shore Road Sarasota, FL 34243-2109 Nonprofit Organization U .S. Postage Paid Permit #500 Manasota, FL Congratulations 2009 Graduates! NCAA welcomes you to the Alum Community! Keep in touch with your friends from New College on the Four Winds Forum, our exclusive online alum community, at: www.alum.ncf.edu/online. Click on Four Winds Forum to enter! We want to hear from you! Update your contact information with NCAA by sending an email to: NCAium@ncf.edu. 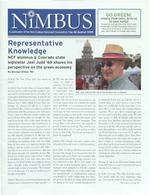 N1MBUS Published by: New College Alumnae/i Association The Keating Center 5800 Bay Shore Road Sarasota, FL 34243-2109 Phone 941-487-4900 www.alum.ncf.edu Editors: Austin McCann '04, Alexis Orgera '95, and Jessica Rogers Nimbus is published three times a year. Unless otherwise noted, opinions expressed are those of the authors and do not represent official policy of the Alumnae/i Association or the opinions of the editors. New College Alumnae/i Association is an affiliate of New College Foundation, Inc. an independent not-for-profit Florida corporation that has been qualified by the Federal Internal Revenue Service as an IRC 501(c)(3) organization. The IRS has also determined that New College Foun dation Inc. i s not a private foundation within the meaning of 509(a) of the Code. The tax-exempt status of New College Foundation Inc. has not been revoked or modified. New College Foundation, Inc. is listed as a qualified organization in IRS publication 78 (Revised Sept. 30, 2000), Cumulative List of Organizations, Catalog Number 70390R, page 852. A copy of the official registration and financial information may be obtained from the Division of Consumer Services by calling toll-free 1-435-7352 within the state. Registration does not imply endorse ment, approval, or recommendation by the State. Since New College Foundation does not engage professional solicitors, 100 percent of all gifts are received by the Foundation. The State Registration Number for New College Foundation is SC-00206. The Federal IRS Identification Number is 59-0911744.